55 degrees. 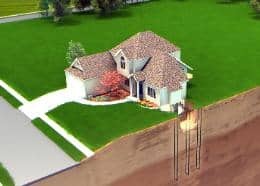 This is why geothermal heat pumps are so energy efficient. The system extracts warmth from the ground even when it is below freezing outside. It can heat your home, and be connected to your hot water heater or radiant flooring. 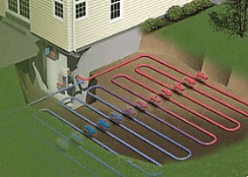 During the cooling season the heat in your home is extracted and either moved to the earth or into your hot water tank. A vertical loop is a good choice for homes where space is limited. Holes are dug 100 to 400 ft deep. A horizontal loop system, like the one pictured above, is the most common type used when there is adequate space available. 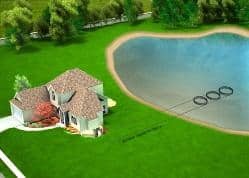 An open-loop system uses a well for a direct source of energy. Coils of pipe are placed in the bottom to collect geothermal energy.